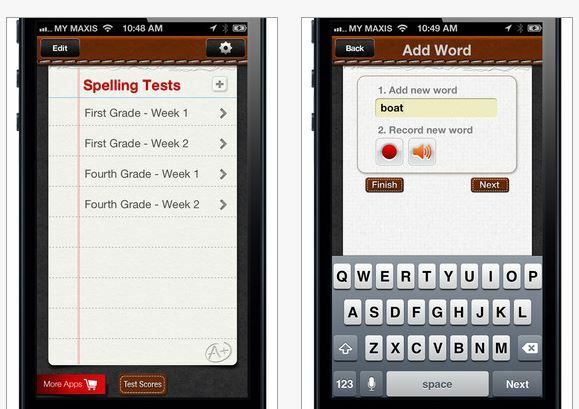 A+ Spelling Test Pro app for iPhone and iPad allows for customization of spelling word lists for students. ✔ Practice spelling on the go. This app is perfect for using no matter where you are. ✔ HUGE time saver! Finally kids can rapidly boost their spelling test scores without your help. ✔ Submit homework by email! After taking a spelling test, just click to submit the results instantly to your teacher and get credit for doing your homework in a whole new way. This might be a way for some students with dysgraphia to work on their spelling without writing! Otherwise pass this app on to parents, special and regular education teachers! This entry was posted in iPhone, iPod, Spelling and tagged App Review, occupational therapy, OT Apps, special education, spelling. Bookmark the permalink.